LOCATION.--Lat 42°02'16", long 73°58'19" referenced to North American Datum of 1983, Ulster County, NY, Hydrologic Unit 02020006, on left bank at downstream side of bridge on Glasco Turnpike, 0.8 mi east of Mount Marion, 1.6 mi downstream from Plattekill Creek, and 4.5 mi upstream from mouth. PERIOD OF RECORD.--Occasional miscellaneous discharge measurements, 1902, 1951, 1956, 1966, 1967, 1969. April 1907 to December 1913 (furnished by Board of Water Supply, City of New York), January 1914 to March 1918 (monthly discharges only, furnished by Board of Water Supply, City of New York, published in WSP 1302), March 1970 to current year. GAGE.--Water-stage recorder and crest-stage gage. Datum of gage is 40.15 ft above NGVD of 1929 and 39.36 ft above NAVD of 1988 (VERTCON). Prior to Aug. 12, 1970, nonrecording gage at same site (at different datum April 1907 to March 1918). REMARKS.--Flow from 256 mi² of drainage area regulated by Ashokan Reservoir since Sept. 9, 1913. Water diverted from Schoharie Creek through Shandaken Tunnel (station 01362230) since Feb. 3, 1924, enters Esopus Creek about 12.2 mi upstream from Ashokan Reservoir. Diversion from Plattekill Creek for water supply of village of Saugerties. Slight diversion at headwaters into Cooper Lake for water supply of Kingston. Diversions upstream during summer months for irrigation purposes. Diversions for water supply of city of New York made from Ashokan Reservoir (station 01363400). 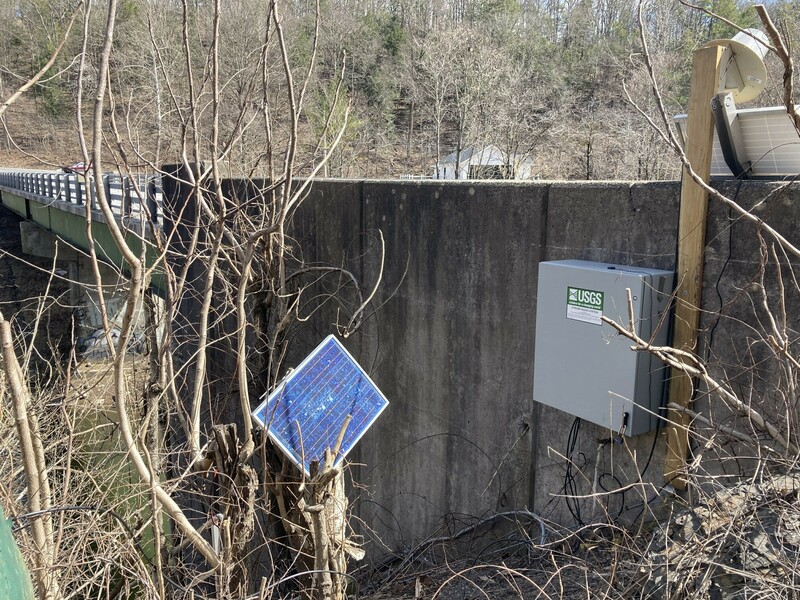 Discharge records for this station now represent the natural flow from 112 mi², together with conservation releases and spillage during high stages from the upstream reservoirs. EXTREMES FOR PERIOD OF RECORD.--Maximum discharge observed, 28,000 ft³/s, Apr. 26, 1910, gage height, 25.10 ft, datum then in use; maximum discharge since March 1970, 30,500 ft³/s, Apr. 3, 2005, gage height, 26.46 ft, outside gage height was 26.19 ft, from crest-stage gage; minimum discharge, 5.3 ft³/s, Aug. 10, 1999, gage height, 11.51 ft. REMARKS1.--Turbidity data are collected every 15 minutes using an in-situ turbidity probe located in a separate 2 inch pipe about 10 ft upstream of the automatic sampler intake tubing. Daily suspended-sediment load and concentration are derived from a regression equation relating turbidity to suspended-sediment concentration. EXTREMES FOR PERIOD OF DAILY RECORD1.--SUSPENDED-SEDIMENT CONCENTRATION: Maximum daily mean, 439 mg/L, July 16, 2014; minimum daily mean, 1 mg/L, Feb. 23, 24, 27, 2015. SUSPENDED-SEDIMENT DISCHARGE: Maximum daily, 6,200 tons, Sept. 30, 2015; minimum daily, 0.23 ton, Sept. 8, 9, 2015.